Animal Wildlife | Dingo | The dingo is medium-sized canine natively found on the Australian continent and even into South-East Asia. The dingo is thought to have once been a domestic dog that has returned to living in the wild now for thousands of years. 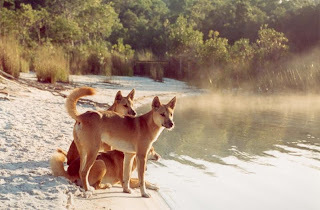 The dingo can be found in a variety of habitats throughout the Australian mainland and it's surrounding islands. Dingos are in both woodlands and rainforests, shrublands and even on the outskirts of the arid Australian deserts. Due to the fact that the dingo (along with domestic dog breeds) is the largest predator found on the land on the Australian continent, the dingo is considered to be an apex predator and therefore plays a vital role in the different ecosystems that occur across the continent. Despite having once been domesticated, today the dingo lives a life completely independent of humans, and dingos can be found in packs containing around 10 dingo individuals. Some dingos are nocturnal animals, where others are more active during the day, but this depends on the climate where the dingo lives. The dingo is a carnivorous animal and one of Australia's most dominant predators. 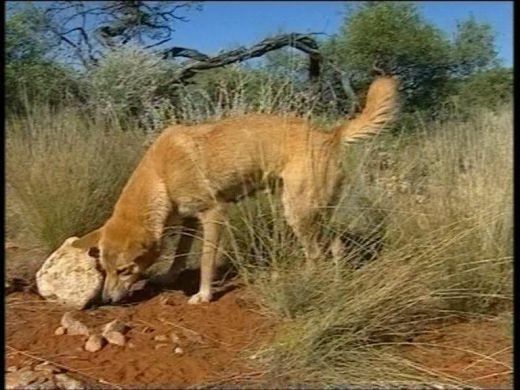 The diet of the dingo is similar to that of other pack-canines such as wolves, as they hunt rabbits, rodents, small mammals, lizards, birds, wallabys and even the occasional kangaroo. Due to the large size and dominant nature of the dingo, the dingo has no real predators within its natural environment besides humans who are responsible for the destruction of the dingo's habitat, and the odd crocodile. Dingos breed once a year, generally before August in the south and after August in the north. After a gestation period of around 2 months, the female dingo gives birth to litter of between 1 and 10 pups. The pups are blind when they are first born but grow up quickly, as dingo pups leave their mother and the den when they are 8 weeks old. Today, mainly due to deforestation and habitat loss, the dingo is considered to be an animal that is vulnerable to extinction. In Australia, the dingo is protected animal and part of their conservation work includes insuring that the dingo does not start interbreeding with domestic dogs, therefore keeping the dingo as a species, pure.